The 2018 season has been an especially exciting one for the youth football players and cheerleaders in Boca Raton, Florida. The Boca Braves, a non-profit Pop-Warner youth league, has had four of their football teams make it to the Pop-Warner Superbowl playoffs this season, and all three of their cheer squads are advancing to the Southeast Regional Pop-Warner Cheer Competition in Orlando at the end of November. 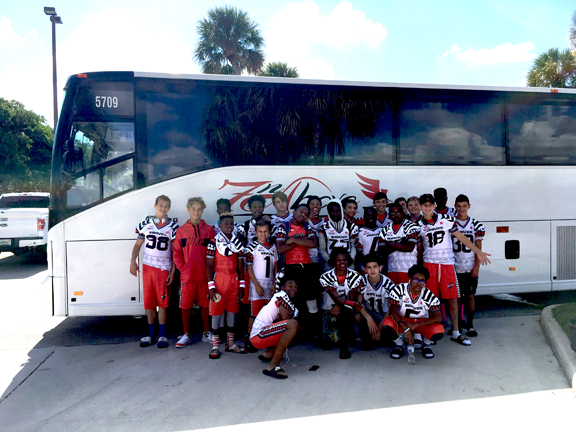 This past weekend, their Junior Varsity football team played in the second round of Superbowl playoffs at Tropical Park in Miami at 4 pm. 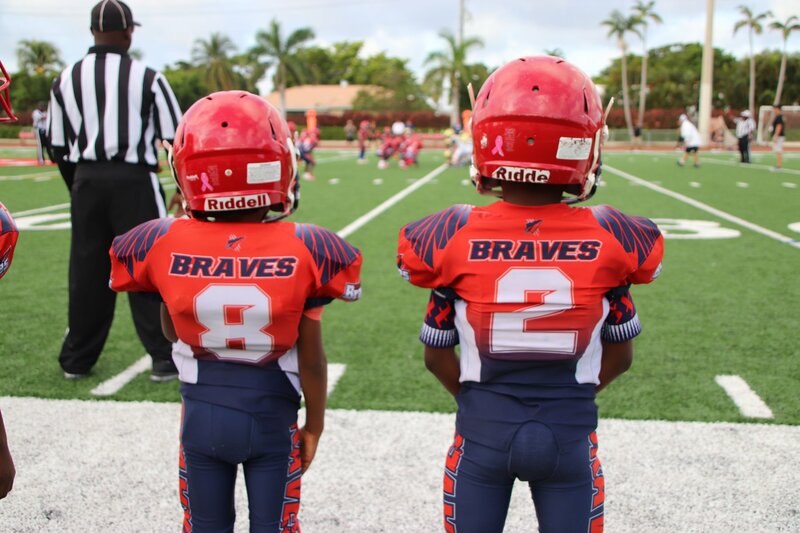 While some Palm Beach and Broward leagues receive city funding, the Boca Braves rely on registration fees, fundraising and the support of local organizations to pay for travel costs, field permits, referees, uniforms, and equipment. With over 35% of their players receiving full or partial scholarships to cover registration, funding needs continue to be a challenge. To support the Boca Braves, consider donating to their GoFundMe page, or visit BocaBraves.com to inquire about sponsorship and volunteer positions. Boca Braves Pop Warner Youth Tackle Football & Cheerleading is a non-profit organization that serves almost 150 of Palm Beach and Broward County youth aged 5 to 15 years old. The league seeks to provide fun athletic learning opportunities for children while emphasizing the importance of academic success. Specifically, Pop Warner seeks to familiarize players and spirit participants with the fundamentals of tackle football, cheerleading, and dance. Pop Warner strives to inspire youth, regardless of race, creed or national origin, to practice the ideals of sportsmanship, scholarship and physical fitness as reflected in the life of the late Glenn Scobie “Pop” Warner. 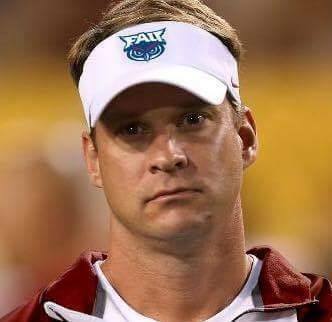 Lane Kiffin headshot from Facebook. Coach Lane Kiffin and FAU are both pretending that his new contract will keep him at FAU for the long haul. The details of that contract have now been released and it shows the lie. The contract purports to be a 10-year deal. Kiffin will earn a base salary of $950,000 a year. There are some other incentives and perks that add value, but they’re small potatoes compared to the salary and to what top college football coaches earn. Several coaches earn over $5M a year and Nick Saban gets over $11M from Alabama. Kiffin is at FAU arguably because his somewhat controversial history made it difficult for him to get a job with a top team. See for example Fox Sports. He’s really at FAU to put in a few years demonstrating his competence (he is undeniably a brilliant coach) and stability until a top team is ready for him and needs him. That’s where the buyout clause in his contract comes in. While it’s ostensibly a 10-year deal, Kiffin can leave at no cost starting January 1, 2022, six years before the end of the contract. If he leaves earlier there’s are set buyout amounts ranging from $2M if he leaves before the end of 2018 down to $500K if he leaves during the 2021 calendar year. Oddly the buyout amounts are cut in half if University President John Kelly stops serving in that “capacity” at any time during the term of the contract. 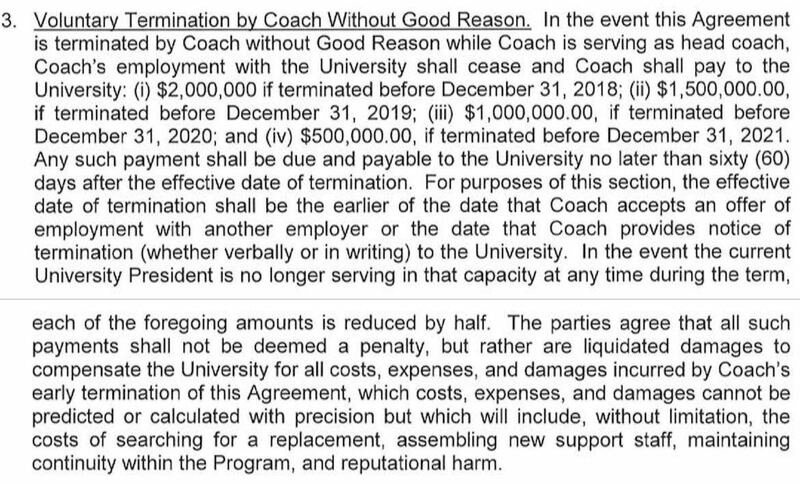 The Kiffin FAU buyout clause, from pages 11-12 of the contract. As a side note, the wording of that part about the University President creates some big potential loopholes. If Kelly takes a sabbatical or a brief leave of absence, does that trigger the reduction? If he leaves the position after Kiffin quits, could Kiffin claw back half of whatever he paid? If a major college football (or NFL) team decides they want Kiffin and are ready to pay him $5M or more, the $1.5M (2019) or $1M (2020) buyout price will be a trivial extra cost. This 10-year contract does little to keep Kiffin in Boca for any longer than the time it will take him to rehabilitate his reputation. We hope we are wrong. We would love it if Kiffin would stay at FAU. He’s great for the team, for the university and for the community. But the reality is he’ll be gone by the end of 2020. On December 19, 2017, football coach Lane Kiffin announced that he had reached an agreement with FAU for a 10-year contract extension. The extension still hasn’t been signed, according to FAU. The same day the agreement was announced we submitted a public records request to FAU for a copy of the new contract. The immediate response, the next day, was that the contract had not been signed yet and would be forwarded to us when it was. Coach Kiffin’s extension is an agreement in principle and the written details are still being worked out. I will be provided a copy of the new contract when it is completed. So we waited. Yesterday we asked again and an exchange of e-mails revealed that Coach Kiffin’s extension has not been signed, and that he is still working under the terms of the previous contract. [T]here is no written contract yet with the extension. Coach Kiffin is still employed under the terms of his existing contract. He and the AD and President reached an agreement in principle on a ten-year extension, which is what he tweeted about. That verbal agreement in principle has not yet been reduced to a written contract. This matters because some in college football think Lane Kiffin’s stay at FAU is only temporary until he lands a deal with a bigger football school. Since his coaching career began in 1997 as an assistant at Fresno State, Kiffin’s longest stop at one place was six seasons as an assistant at USC from 2001 to 2006. As a head coach, his longest stop also was at USC, where he was fired five games into his fourth season. One would expect that the contract extension would make it harder for Kiffin to leave FAU. If it hasn’t been signed, that means he’s still relatively free to leave for somewhere else. We would like to hope that Kiffin is here in Boca for the long haul. He’s a great coach and we’d love to see FAU continue to improve. But the lack of a signed extension suggests that he may still be waiting to see if a new opportunity comes up. We reached out directly to Kiffin and to FAU Football but neither has responded. What year did your business start? We opened our studio, Dynamite Dance, in the Shoppes at Loggers’ Run in West Boca in 2008. We also run a studio in Coral Springs. We represented Great Britain in Figure Skating from 1985 to 1990. Our highest achievement was a silver medal at the World Professional Championships in 1990. After our competitive career we toured with ice shows all over the world, primarily with the company called Holiday on Ice. We have coached figure skating in the UK, Canada and the U.S. and served on the coaching staff at the Panthers Ice Den in Coral Springs from 2000 to 2014. How and why did you get into the business? Lisa has been dancing since the age of five. Her love of dance and music led her into ice dance. When she retired from ice dancing, she decided she wanted to continue working with kids. And she didn’t want to be cold anymore! Ballet, Jazz, Tap, Hip Hop, Contemporary and Acro. We offer the American Ballet National Training Curriculum. We also have programs for dancers as young as 18 months and a competition dance team. See our schedule. What do you love most about the business? The flexibility and meeting new people. What do you think is your biggest challenge with the business? Getting the word out that we are in the area. What do you want the community to know about you? We are a family kid friendly business and we like what we do. We are not a high drama studio of the type typically shown on TV shows. We are professional and courteous! Second update: An additional set of documents was released by the Jupiter Police Department later in the day. While it adds statements from additional police officers (unusual for a routine DUI), there isn’t much new information and it still does not include anything from the “Drug Recognition Expert.” The new pdf is at bottom. Update: We now have more documents. They show Tiger cooperated, blew 0.000 twice, and voluntarily supplied a urine sample. Documents will be added soon. The breath test showed no alcohol at all. Woods breath test showing 0.000 twice on subject samples. Image copyright Warren Redlich 2017 (based on added markings); media may use by crediting West Boca News or @WestBocaNews. We have obtained initial documents from Tiger Woods’ DUI arrest. Below are the two tickets, one for “Improper parking” and the other for DUI. The probable cause affidavit shows the circumstances leading up to the encounter, with the officers saying they found Woods sleeping his car in the right lane. From the Tiger Woods probable cause affidavit. Image copyright Warren Redlich 2017. Media may use by crediting West Boca News or @WestBocaNews. Woods did poorly on the “Field Sobriety Tests” but these are designed to look for alcohol impairment and the breath test shows that Woods had no alcohol in his system. Field sobriety tests and breath results on Tiger Woods DUI arrest; image copyright Warren Redlich 2017; media may use by crediting West Boca News or @WestBocaNews. 1. They did urine but did not draw blood. Blood testing is generally far more reliable than urine testing. 2. An Officer Borrows “did DRE”. This refers to a “drug recognition expert” doing additional tests. They are not really experts. They typically are high school graduates with perhaps a couple weeks of training. The affidavit does not show the results of any DRE testing and it’s unclear if it was documented at all. We created “jpg” versions, below, and the original pdf documents are at the bottom of the page. First, Tiger’s parking ticket, which is likely the reason police approached his vehicle in the first place. The ticket says specifically that his vehicle was “stopped on roadway in right hand lane and right shoulder,” in violation of Florida Statute 316.1945. The ticket does not indicate a specific subsection within the statute. There’s some chance this could be a problem for the prosecution if the case is fought. The ticket also indicates Woods was driving a black 2015 Mercedes sedan (4 door), and that the incident took place at 2999 N. Military Trail in Jupiter, at or near Indian Creek Parkway. Our best guess is that this was somewhere south of that intersection, and north of Dakota. Military Trail in Jupiter between Dakota and Indian Creek Parkway; image and map data by Google. It’s also noteworthy that the tickets show no crash and no injuries. Together this suggests that Woods was stopped on the side of the road, leading to police approaching his vehicle. We are hoping to get additional documents including the probable cause affidavit and breath test results but so far they are not available. These will be much more helpful when we get them. The DUI charge is indicated as 316.193(1). Unlike the parking ticket this does indicate a subsection but there is not enough detail to say whether it involves alcohol or drugs. It appears that the parking ticket was issued by an Officer Palladino of Jupiter PD, and the DUI ticket was issued by an Officer Fandrey, both assigned to the road patrol unit. Update: Full pdfs of the probable cause affidavit and breath test report are below, then the tickets follow. Full pdfs of the tickets are below, DUI ticket first.